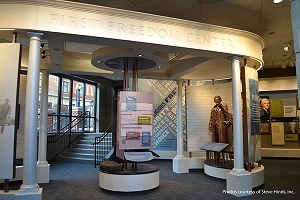 CMS has been engineering, building, coordinating and installing custom interpretive exhibits for over 25 years, for customers in the sports, military history, natural sciences, cultural history, archeology, hard science and children’s discovery markets. To achieve this, Capitol Museum Services has grown methodically, gradually expanding its fabrication and installation services to include detailing and value engineering, graphic and art production, metalworking and custom finishing, artifact bracketing and on-site mounting. As a result, the company continues to build an impressive portfolio of work with projects both in and around Washington, DC and far beyond.